With your mother a fashion designer and father a master carpenter, you must have grown up immersed in the design world. How did this influence your career path and shape you as a designer? Creativity is interwoven into the fabric of my family, especially when it came to discussing new ideas. We are known for our arguing, debating and philosophising until the sun goes down and this originates from my father, who has a reputation for never giving-up! I am pretty much the same: I always look for new challenges and new ways to solve an old problem. I try to invent rather than redesign. How does this continue to shape your work today? My family is a melting pot of male and female ideas and I now make a point of always asking my wife’s opinion first, before I create anything. This gives me a different perspective on the project and opens my eyes to things that I may have otherwise missed. You have lived, worked and studied all over the world. How has this influenced the way in which you design? My travelling has led me to understand that culture, which is linked to history, plays a major role in how one views what is a good design. The great thing about design is that there’s no right or wrong. It’s just a matter of understanding the perspective in which an object was made or created for, in short its purpose. What drove you to form your own studio? How do you structure it? And where do you see it in 10 years? For as long as I can remember, I was always interested in creating anything, absolutely anything. Whether it was a spaceship, artwork or even a way to build a time machine, thinking about new ways of invention is still a daily, exciting activity for me. So, making a studio of creativity has come naturally to me. My studio is actually in my head! We have set up a wide range of experts, from architects to designers, but my main criteria is to work with people who are open to creativity and possess an oldschool, hard-work mentality. Where do I see my studio in 10 years? I don’t have a clue. Working for a range of clients and self-initiated projects – what themes are recurrent throughout your work? My main goal is always to help people in their daily lives. Whatever ‘help’ means: to bring joy, ease of use or making a product fulfil its purpose to the fullest. Aesthetically, I’m constantly striving for simple elegance and an intelligent balance proportion, just like the genius of nature. What is your design process? How is this apparent in the Vero range? 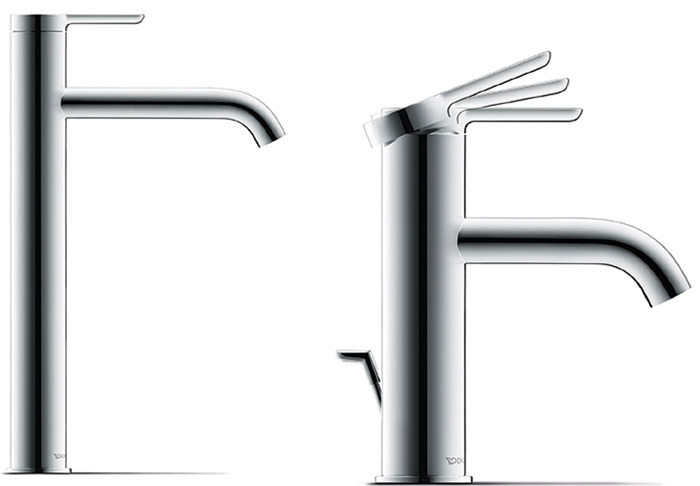 Were the C.1 tap fittings designed with the Vero range in mind? I don’t have a design process, just a way of thinking, or better yet a way of exploring. My design process is constantly evolving and involves intensive day dreaming and vigorous sketching, which results in a final sketch. Honestly, as soon as the idea is established, I genuinely don’t know how I arrived at it! This applies to the Vero collection – I have a pile of endless sketches. The aim was to use the minimal form of expression and yet still have a distinctive look. The C.1 series started with the generic spirit of Vero. It then evolved into its own unique look that fits to almost any sink it combines with. How do you adapt your way of working to fit a client’s brief? The brief is always a good starting point – however, the best way is to have a conversation with the client, to understand and feel what lies between the lines, such as the vision or the motive behind the brief. How much control do you maintain in the production process? It depends on the client and the relationship you have with them and how much effort you want to put into the entire process. The more questions you ask or the more you question a process the more you get involved. For example, working with Duravit can be very technical at times, nevertheless, it makes a point of keeping the initial idea or vision constantly in sight. It takes the process of exploring ideas and possibilities very seriously, which gives me the freedom of creativity. You work across furniture, interiors and architecture. Do you have a favourite? No, it just has to be something that fulfils its purpose in the best possible way. How did your relationship as a key designer for Duravit come about? Simple: the same way I make my sketches – persistence and hard work. What’s the best, and worst advice anyone has said to you? The best: Present your ideas at the right time. The worst: I can’t remember any bad advice, because the bad advice never sticks with me. What advice would you give to young designers trying to make it today? Just do it, just do it and never work for free.